Does anyone else notice that the quality and nature of penmanship changes depending on the nib, pen, ink, and paper?? Here's a sample of my sloppy handwriting. Practice in progress. Edited by AlohaJim, 17 February 2019 - 17:16. 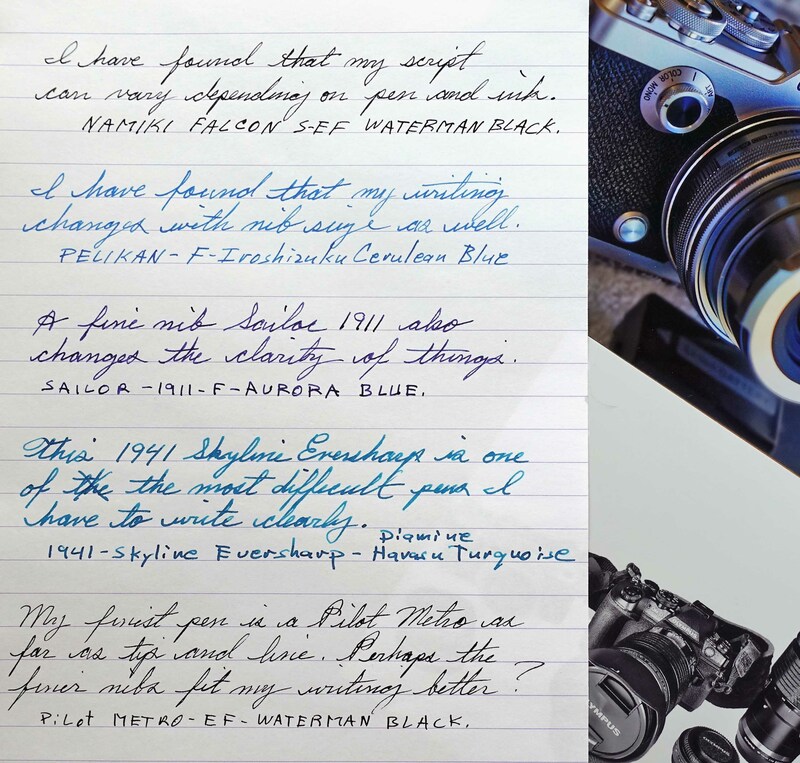 That the ink/paper/pen combo has an effect on handwriting is one of the inescapable truths of fountain pendom. It can drive me almost crazy. I thought is was not common and most here had beautiful handwriting no matter what they write with. My handwriting definitely changes with the pen. Not sure about the ink or paper (except crappy paper), but definitely the pen - either because of the nib size / style or the way I hold the pen itself. Add to the mix posture and how tired you are -- not to mention what nib width you're using, and how quickly you're writing. I'm sure that if some handwriting "expert" took a look at one of my standard morning pages journal entries, they'd be convinced I had multiple personality disorde. Why? Because the slope and gereral legibility often varies within an entry (and at times, within the same paragraph) -- even when using the same pen for the entire entry.... Just depends on how awake I am at the time, whether I sitting up in bed or lying down, even if I run out of ink and have to grab a different pen (or pens) to finish that morning's three pages' worth of content. My 'normal' handwriting – when I'm not trying particularly hard to conform to someone else's 'style', or rules for a particular calligraphic 'hand' I may be learning or practising – is indicative of aspects of my personality. Lots of pointy corners and abrupt changes in direction of the strokes in my cursive, and I like very sharp 'tails' at the ends of words. As such, broad (from 'Western Medium' and up) round nib tipping on a nib would cramp my style, and therefore hurt the quality and/or character of my handwriting. Observable feathering (by one's eye unaided) of the ink on the page typically fills me with contempt and disgust, which of course then also affect the quality of my handwriting in a sort of vicious circle. I generally find slender pens (with barrel diameters of less than 14–15mm) to be harder to control and use to produce the pen-stroke shapes I like. Nibs that feel like 'butter on glass' impedes my ability, and sooner or later end up in the trashcan; I need some kinaethestic feedback from the nib to write properly and 'express'/execute the shape of each pen-stroke as I intend it. Everything matters: pen, ink, paper, desk, chair ... not to mention sleepiness, haste, anger ... Almost every time I pick a pen nowadays I realize something new. At the same time, there are things that never change, for example that I'm quite comfortable with pens other people may find hard to hold, like the Pilot Capless and the OMAS 360. So, if something else fails, there's a safe option to which I can always resort. That's the idea behind a morning pages journal. Three pages of whatever comes into your head goes onto the page; then put it away, and go about the rest of your day. (There is a later chapter in The Artist's Way where you actually go back through what you've written and note where you had breakthroughs and general "Aha!" moments. But mostly I refer it it as my "daily core dump".... I actually started with a cheap 8-1/2" x 11" spiral bound notebook -- but realized I was taking up too much of my morning, so I started looking for smaller format journals after a couple of weeks. (5" x 8" or 6" x 8" turned out to be a better size). Of course I tend to squeeze two lines of writing into the space of one line -- so it still takes me about an hour or so. OTOH, on the days where I can't do it (or have to try and do it in the car while my husband drives, or such) I'm invariably out of sorts -- on Saturday I had to get up really early to go to an estate sale and managed to get the first page and a half done before leaving the house, then finished the rest in a parking lot; on days like that I often do the writing while treating myself to breakfast someplace. Just so I can finish. But I'd rather get pages done absolutely first thing (I keep the journal (and the canister of currently inked pens) on a small bookcase next to the bed, so I can just reach over for the current volume (and whatever inked up pen tickles my fancy on any given day) as soon as I turn off the alarm -- which also lives on that bookcase. Absolutely. Pen, paper, ink, and all the variables others have mentioned, make big difference to my handwriting... and just to be really awkward, that often doesn't corrolate with the pens I enjoy using. I have a weird love for the wet writing, hooded, Jinhao 301s. Throw a remotely lubricated ink in there and it really is a "butter on glass" experience, which I find very satisfying. Between the lack of any feedback and the small sweet spot though, my handwriting's an absolute disgrace. Edited by ScarletWoodland, 19 February 2019 - 23:02. Throw a remotely lubricated ink in there and it really is a "butter on glass" experience, which I find very satisfying. Between the lack of any feedback and the small sweet spot though, my handwriting's an absolute disgrace. There are quite a few things (many) humans enjoy doing that are wet, sloppy, and do not stand up well to rational scrutiny. I think that's perfectly fine.